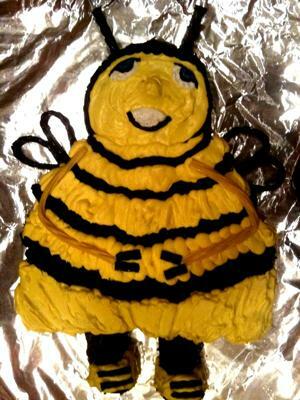 To make this Bee Movie birthday cake, I went mostly by the directions that was given on this site, however I did use a few tricks of my own. On the wings, I have small children and didn't really want such a hot substance with them close by, so instead of melting the butterscotch (which by the way was a cute idea also), I heated the black licorice and bent them in the shape of the wings, like you see in the picture. Also, I wasn't too steady with the cake bag and tip (never used this before, by the way). I used a toothpick to draw the outline of the features of the face and then use the toothpick to spread the icing for his face. The laces for his shoes I used again the licorice. The arms, I couldn't find any long strips of yellow laffy taffy, so I just bought a bag of the multicolored twizzlers and used the yellow ones. That's about all I altered. Except for the design of the sweather and I guess everyone's looks different. HAD A BLAST MAKING IT! I use twizzlers all the time for different things. Good ideas and very creative ways to use those ideas! p.s. Thanks Nancy! You've bailed me out several times too!